This is the journal of an Army Chaplain, the Revd Sandy Reynolds RAChD, who served from November 1943 to January 1946 as chaplain with 120th Light Anti-Aircraft Regiment RA. 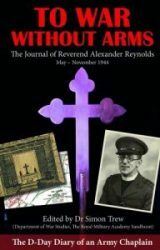 The journal is well written and it casts considerable light on the duties of Army chaplains during the war, as well as on aspects of the Normandy and north-west European campaigns. It contains several emotionally powerful episodes and nothing in the way of religiosity, piousness or religious ranting. Reynolds comes across as a decent, humane man who was primarily concerned with doing his duty as a chaplain and helping members of his regiment get through the war. Reynolds landed on ‘Gold Beach’ in Normandy on D plus 1 (i.e. 7 June 1944). His journal covers the period from mid-May 1944, when he was preparing to participate in the invasion, to mid-November 1944, by which time his regiment was located in Holland, helping to protect the Scheldt shipping lanes. The Journal has been expertly edited (for clarity only and appropriate endnotes added) by Dr Simon Trew, (Department of War Studies, The Royal Military Academy Sandhurst) a renowned historian and Normandy Campaign expert who has also written detailed explanations and introductions to the chapters. A fascinating and often overlooked area of the Normandy Campaign which is illustrated throughout with contemporary photographs of Revd Reynolds and Normandy.